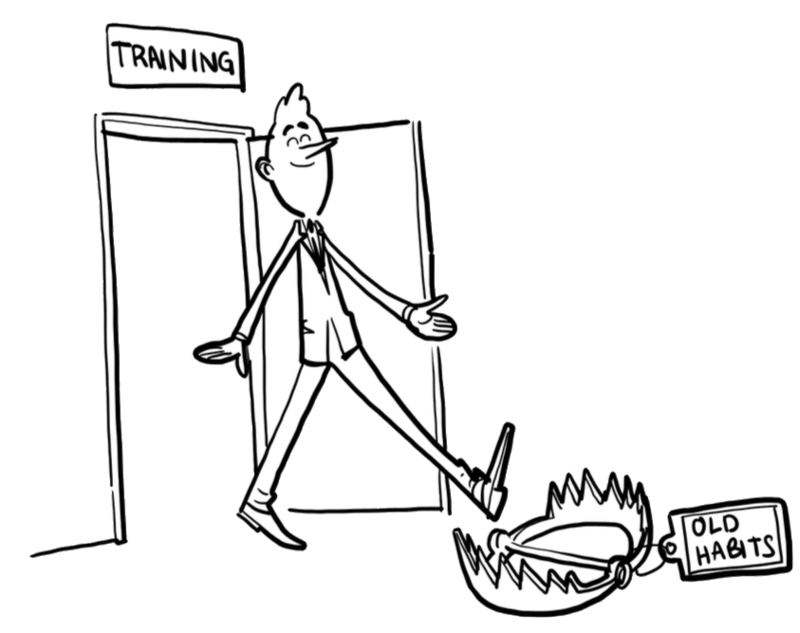 There is little point sending people on Sales Training courses, most of it is forgotten in a few days. Despite good evaluation scores there is often no change in the way people work. Unless your organisation knows it must change, it won’t. You have to be suffering a degree of pain to appreciate just how important it is to change. Often the Head of Sales appreciates the problem while the rest of the Sales Force don’t, so you may need to create a ‘burning platform’ to bring home to people just how urgent the need for change is. One way to do this is to look at the sales competencies of your team. Relate the competencies to the specific demands of your Sales Process and decide what level of proficiency each role requires, just as if you were interviewing for that role. Then see how your current team shapes up. You can also ask your team to complete a self assessment and compare it to the way the manager rates them. Any mismatches should bring home the need for change and training. In addition the research carried out by Infoteam recently about the huge level of dissatisfaction among customers with vendor Sales Teams should bring home the need for change. “Sales Transformation is about something much more powerful than a sales process. It is about a culture. With this program, we want to complement the expertise that we undoubtedly have with a revitalized commitment to developing excellence in sales. What we are talking about is identifying, winning and growing the right business, and making this approach part of our culture. This program is so essential that my Board colleagues and I will be taking close personal interest in its progress”. And you will need buy in across the organisation once the top management has committed; including HR to make sure personal performance objectives are aligned with the sales transformation program. And of course compensation; if you want the Sales Process to change then the pattern of compensation must reward the right behaviours. Before we get on to those crucial things that make training stick, let’s look at the training itself. Infoteam has been improving both its contents and teaching methods for many years and has developed some principles that apply to every course we run. Firstly we believe in relevant tools that help Sales people win business, not ones designed to exert control. Secondly the teaching methods make a big difference. We know that practical exercises based on real proposals lead to learning that people can put into action as soon as they get back to the office. Sales leaders need to set the direction, create and maintain momentum. This means leading from the front by using the principles of the “New Way of Selling” themselves in all the work they do. Even the language they use has to be the language of the Sales Process. The technology has to be there to support the Sales Person and help them easily use the training content. Which sounds obvious but there is software out there that actually hinders Sales people, making them spend time filling in data for managers rather than selling. With managers so vital as leaders and coaches, the single thing most likely to make a Sales transformation really stick is making sure they understand and implement the “New Way of Selling” properly. I have found the best way to support our customers is not just to test the Sales Team or offer Refreshers, but to work with their Sales Managers. Our consultants accompany managers running their Deal Reviews and then give them feedback.